Informed readers will probably know that a suggestion has been put forward, ostensibly to cut down looting and smugglingd to "open the antiquities market" in India in a similar way to what exists in Britain. 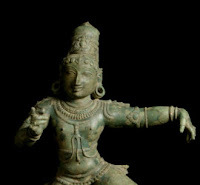 British heritage professionals are silent about this, but S Vijay Kumar (a shipping professional working in Singapore, owner of the poetryinstone blog) wrote an articulate response to this idea: 'Antiquities: An Open Market Won’t Stop Smuggling' (Swarajya 11th June 2015). He argues for tightening up the legislation (Antiquities and Art Treasures Act 1972) and enforcing it to "send out warning signals to those who buy these treasures".